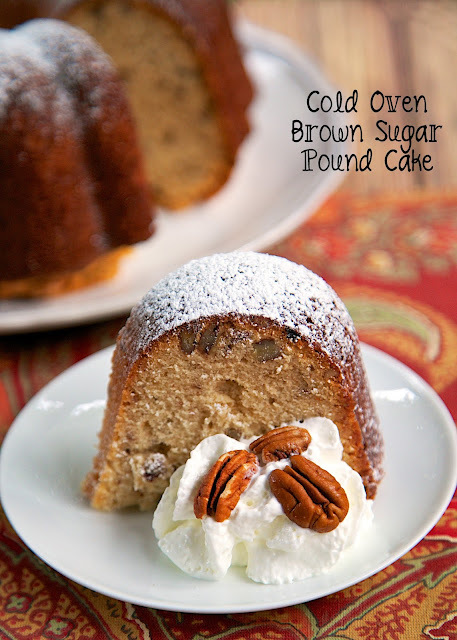 Cold Oven Brown Sugar Pound Cake Recipe - amazing pound cake packed full of brown sugar and pecans! This cake is placed in a cold oven and baked while it preheats. No waiting on the oven to preheat! Tastes SO good! A few months ago, we went to a cooking demo at the Sub-Zero/Wolf showroom in Atlanta. 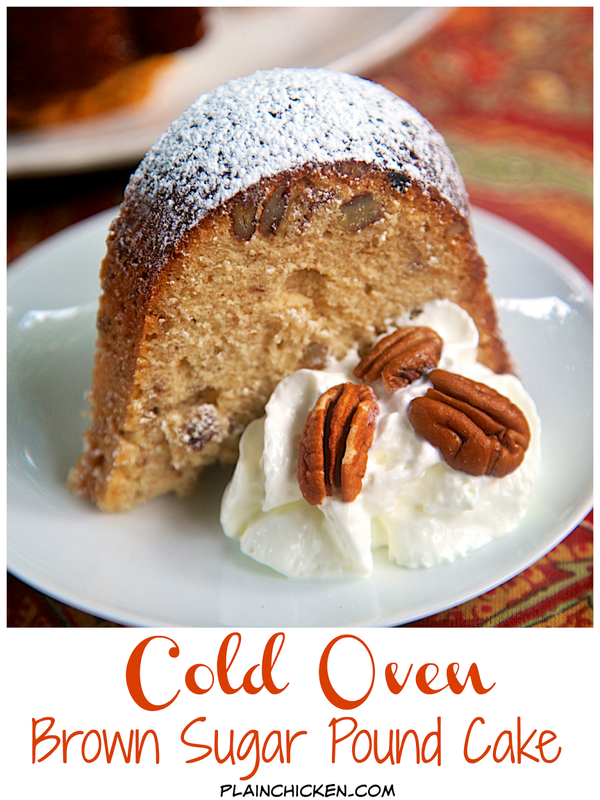 The chef prepared a cold oven pound cake. It tasted delicious, and I was definitely intrigued with the cooking process. I've always wanted to throw my cake in the oven without preheating. I found a recipe and gave it a try. The cake tasted delicious and was easy to make. Just whip up the batter, then put the cake in the oven and turn it on. SO easy! No waiting on the oven to preheat. The cake is formulated to cook and rise properly while the oven preheats. Neat! This cake is so delicious! 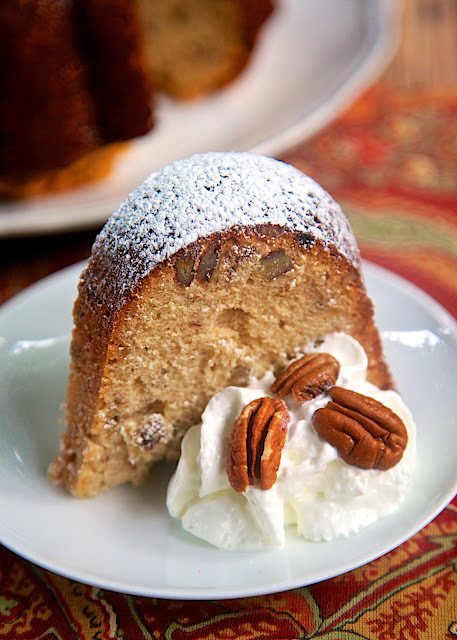 It is packed full of brown sugar and pecans. My favorite! It is especially good with some ice cream and whipped cream. One note on this recipe, make sure to use cake flour and not all-purpose flour. Cake flour is different than all-purpose and the cake won't turn out with regular all-purpose flour. Do not preheat oven! Grease and flour a 10-inch Bundt or tube pan. Beat butter and shortening in a large bowl at medium speed with an electric mixer until creamy. Add brown and granulated sugar, beating at high speed for 5 to 7 minutes. Add eggs, one at a time, beating only until the yolk disappears after each egg. Sift together flour and baking powder. Add to butter mixture in three additions, alternating with evaporated milk, beginning and ending with the flour. Beat batter on low just until blended. Stir in vanilla and pecans. Pour batter into prepared pan. Place in oven. Set oven temperature to 300 degrees. Bake for 1 hour 30 minutes to 1 hour 45 minutes. Cool in pan for 10 minutes. Remove from pan and cool completely on wire rack. This is a great process. Not pre-heating the oven would definitely help keep things cooler in the summer. The cake looks tasty. This looks absolutely perfect!! Add some caramel and ice cream and I can't even. Cake flour is nothing more than regular flour with added baking powder. Just add to regular flour, sift, and continue with recipe. It is actually regular flour with cornstarch - for every cup of flour, remove 2 Tbsp of the flour and replace with 2 Tbsp of cornstarch and sift. You need to sift it 4 or 5 times. It always makes me nervous when it says....cold oven. Intriguing for sure! Your cake makes me want to do this. Looks scrumptious! Wow cold oven. I am intrigued by this process. Like the idea of not wasting energy preheating an oven.